I will usually make couscous with basil shrimp at home but it works well with the Genova tuna I was sent. 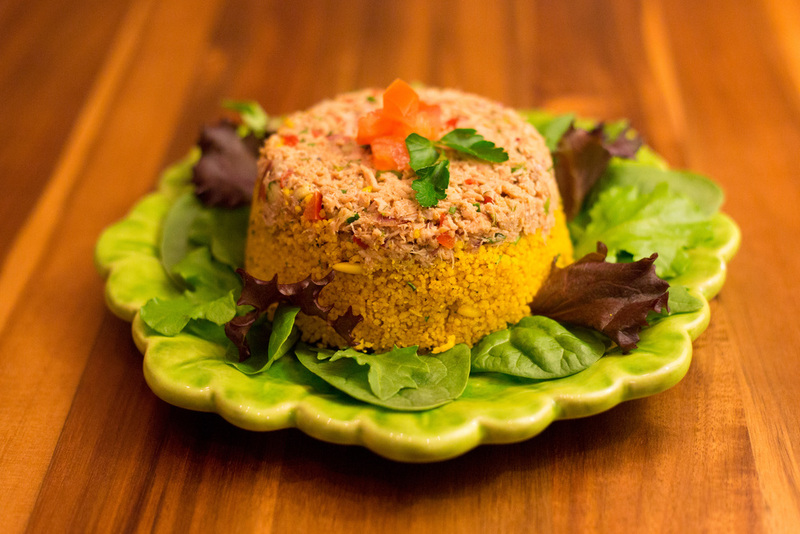 The cool, refreshing tuna atop of the warm, paprika spiced couscous will be a crowd pleaser. We love Mediterranean and Anatolian food, give this a shot and you will not be disappointed. It's easy too! You'll need a few pots and two oiled ramekins to make what you see above. Do not overly oil the ramekins or else the couscous will stick! Approximately 2 servings. Prepare the tuna mixture and let sit in the refrigerator for an hour. Heat olive oil in pot at medium heat for couscous. Put pine nuts into oil and let toast for about 2 minutes, stir constantly to prevent burning. Add garlic and red onion, sauté for 1 minutes till clear. Pour in cumin, turmeric, brown sugar, pepper, paprika and toast seasoning for no more than 1 minute. Add a little salt to taste. Add couscous and toast for 2 minutes. Pour in lemon juice and let reduce. This will happen quickly. Pour in chicken stock and cover pot. Remove from heat and let sit for 15-20 minutes. After stock has been absorbed by couscous, fluff with fork. Remove tuna from fridge and press half of the tuna into an lightly oiled ramekin. Fill the rest of the ramekin with couscous, press firmly. Flip ramekin onto plate and tap top until you hear a hollow sound. Gently remove ramekin.